A successful file with fold over bleed is needed. Correct design specifications must be used for automatic printing. If you are unsure how to create a file suited for automatic wholesale printing, please watch our handy videos. How it works - upload to print banner signs in just 3 easy steps! Input your customer dimensions using our Easy Template Maker, generate and open in Photoshop, overlay your designs and flatten. Save as Photoshop PDF. Upload a Photoshop PDF and your design is instantly placed into the printing queue, set for grand format printing and a preview is generated. An instant preview appears showing you the details of your order and any sewing positions for your pole pockets, hem etc. The Instant Preview is your online proof that you can email or forward to your customer or manager or approve and pay. The intelligent Easy Template Maker generates a file you can open in Photoshop and overlay your designs. Approximate Sewing Positions	Manufacturing technique for hems, folds etc Zoom and any relevant information for the options you choose as you generate the template. The Easy Template maker also has a free PDF Info sheet you can download and print as a reference	for you or another designer. For the designer... Open it in Photoshop, then overlay your designs, flatten and save as a Photoshop PDF. Save effort trying to estimate pole pockets, rear hemming, flag fly ends and lots more... generate it via the ETM. All orders with Hems or Pole Pocket(s) and other(s) MUST have fold over bleed. Photoshop PDF's are preffered because they CONTAIN META DATA that can control the size and format, excecute accurate color representations and successfully flatten large files to suit an output less than 150mb at 72 dpi that will pass automatic processing checks for web2print machinery. You'll need ONE Photoshop PDF (single page PDF) for each line item, so that when its time for printing and generating your Instant Preview, the system knows you have different line items for each creative design. Once your UPLOAD IS COMPLETE an Instant Preview will appear allowing you to confirm all the details of your Line Items suited for instant printing. What is the correct SETUP SIZE with fold over bleed? ALL ORDERS ARE DIFFERENT... so we created the ETM, please use it. All orders with Hems or Pole Pocket(s) and other(s) MUST have fold over bleed that varies suited to the order. Some FOLD OVER bleed sizes are: 1" hem. The hem is called Material Over Size (fold over bleed) that the factory cuts and folds over. 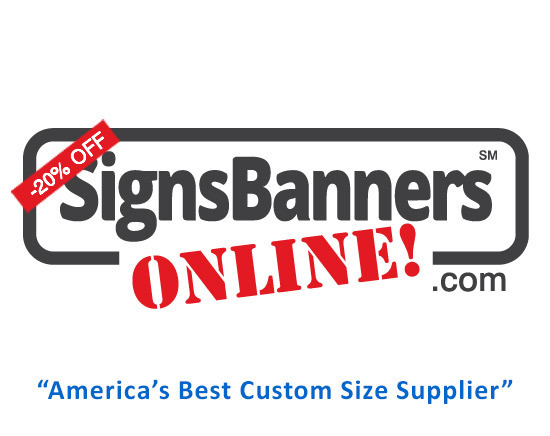 Example: 216"x74" outdoor banner sign requires a 1"+216"+1 so that the edges are folded AND 1"+74"+1" dimension. To check if your file has suitable 'bleed' Material Over Size, Use the Easy Template Maker to compare dimensions. Can I create a 50% size? Sometimes! If your banner size is HUGE, some software limitations may be applied. We use and recommend the Easy Template Maker. The Easy Template Maker will tell you the best 'downsize' to use. Please keep in mind that SCALED down proportions must be correct for automatic processes to begin. Downscaling files. 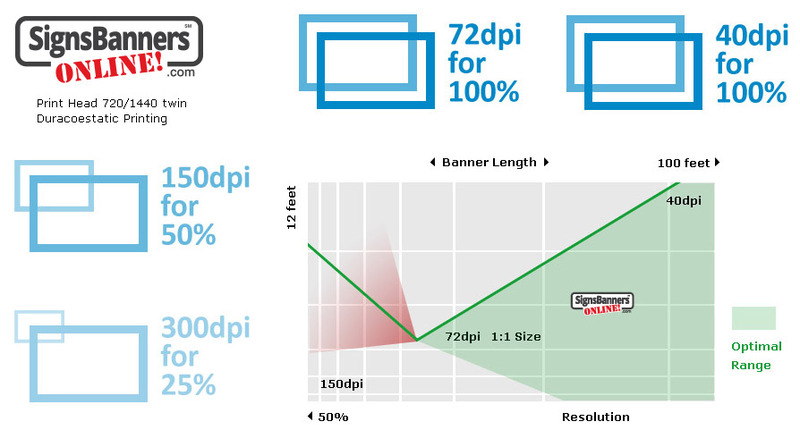 Your best results are when you design 100% at full size 72dpi. You can use CMYK or RGB. RGB will be converted to CMYK digital. Specific color numbers are converted to CMYK digital. Compose your art elements into a single page and flatten. Compose your art elements into a single file - single page. You cannot upload a 'multi page file'. We suggest you or your designer watch our 'How To' Videos pre-ordering. It's a great way to ensure your custom files match the required specifications needed for instant printing. Their banner files do not have sufficient fold over bleed. They save as the wrong format. They didn't use The Easy Template Maker (aaaah!. it's free!). Watch this excellent video > #1 Thing people need to get right! Typically large banners and billboards are printed at 40 dpi We allow 72 dpi that converts to multiple-pass 1440 grand format digital. Remember to design your orders at FULL	ONE TO ONE SIZE as recommended by The Easy Template Maker. If your order is TOO LARGE FOR PHOTOSHOP,	Down scale the file resolution... keep the dimensions. Large signs plus banners do NOT HAVE the same 'rules' applied as business card or paper printing small media etc. We are the opposite to the publication industry. We need you to keep your files One to One. If your order is HUGE... Down scale your file to achieve 150mb at 72 dpi. We do not use 'trim away bleed' like traditional paper products. We use a term called "MATERIAL OVER SIZE" also known as 'fold over hem'. This means, we need extra fabric/vinyl edges to fold over and become the 'hem' of your orders. If you incorrectly add 1/8'' inch	inch bleed or any other feature other than recommended by The Easy Template Maker, it may print disproportionately or show your marks on the print. Human interaction is minimized and your designs are instantly placed into the printing queue without human inspection. Typically, we need 1 inch	or greater for fold over bleed. YES You can have graphic color on the hems, but remember these will be folded over to become the underside hem. You may upload other print files such as Illustrator, Pagemaker, Indesign etc but these do not have all the neccessary META DATA tags within the file for hassle free automatic printing and may miss some elements. IF you use a vector based program YOU MUST CORRECTLY SCALE your file media box. Vector based programs save filesize... however we work with and print with pixels (rasterized) graphics. We suggest you place your Illustrator or Corel vectors inside a Photoshop PDF file, rasterize all fonts, curves, smart layers and vector objects... then flatten and save as a Photoshop PDF. Vector based files may fail pre-flight inspections if not correctly saved, embedded or tagged. Vector based files may incorrectly 'scale or proportion'. Vector based files may not hold correct color information and may convert inaccurately. Convert all smart objects, fonts, lines or blends to curves pre-upload. Do not embed elements. Flatten to upload. We recommend that you save out as an' original Photoshop file, overlay your designs	and flatten. Then save as a Photoshop CMYK PDF. Ready to participate and join us? "Sometimes overlooked, Signage gives you a great business channel for your studio"